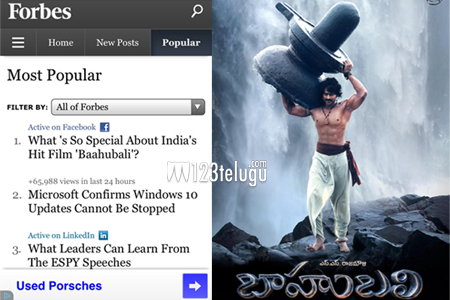 A couple of days ago, we have reported that Forbes, the international biweekly magazine, has published an article commending the India’s biggest motion picture Baahubali. This article was penned down by Rob Cain, a senior movie correspondent from Asia. As of now, this article is attracting many global readers over the past few days and it is currently the most trending article of the magazine in the recent times. The article gave a thorough description on how this movie is crushing the box office records all over the world. It has also lauded the efforts of the core team for their hard work in churning out this visual spectacle. Directed by master storyteller SS Rajamouli, this movie features Prabhas, Rana, Tamannaah, Anuskha and many others. Arka Media Works banner has produced it.